This week we’re adding a generator to my 2 year old 3D Printed Wind Turbine. Which method will work better? A DIY built Alternator, or a repurposed Stepper Motor from a 3D Printer? There are many different way to convert rotational energy into electrical energy but all of them boil down to the same concept. Move a magnetic field back and forth over a chunk of copper to get its electrons flowing, then direct the flow of electrons towards something useful. Sounds simple right… Yeah, that's what I thought too. Being an overachieving DIY Maker guy, naturally my first thought was to dive in and build my own 3D Printed three phase alternator. With information gleaned from DIY wind turbine websites, I set out on a quest of electromechanical discovery. 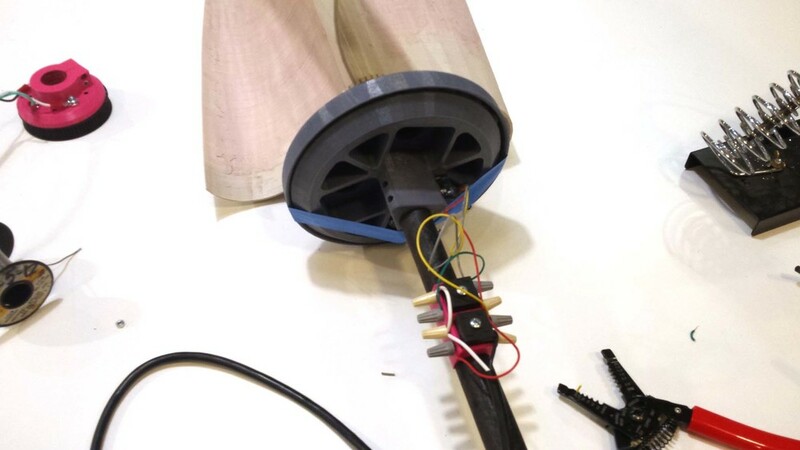 The Alternator used 9 coils of 22 gauge copper wire wound around 3D Printed cores and pressed into a supporting disk. The coil’s are connected in alternating set of three to create a phase. The three Phases of the alternator are linked in a Star configuration, with the three outputs connected to a pair of bridge rectifiers. A disk holding 10 alternating rare earth magnets is attached to the turbine’s spinning blades and the alternator's coils are held stationary on the support pole. In theory, when the wind spins the turbine blades, the magnet will will spin above over the coils. The alternating magnets will pass alternating negative and positive magnetic fields over the coils, exciting the electrons. The electron's movement is rectified in to DC power by the two bridge rectifiers. With everything assembled and the wind blowing, let's see how much power were producing. Those are Microvolts… 196.9 Microvolts... Yeah, My alternator doesn't work very well. I’ve been a 3D Printing Nerd for years now, which mean I have a lot of NEMA 17’s around from fixing and maintaining my printers. I've heard Stepper motors can make great little generators. We set up a quick bench test. An Adafruit NEMA 17, 2 bridge rectifiers, a multimeter, capacitor, lightbulb, and power drill. The theory is, we’ll spin the NEMA 17 with the power drill, which will produce an alternating voltage in each of the two coils. 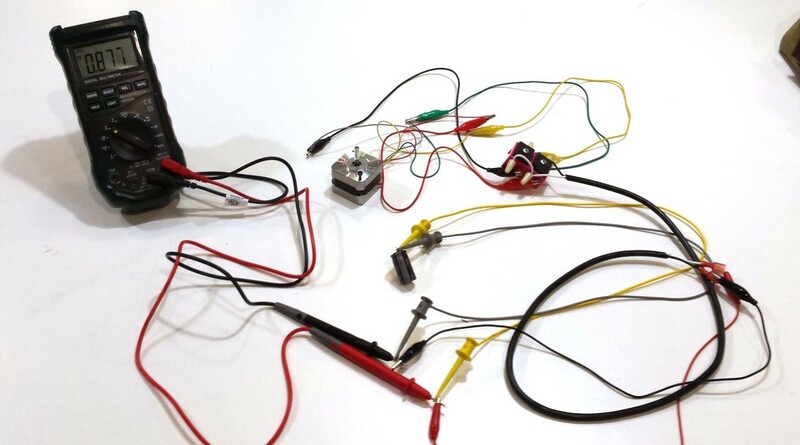 The rectifiers will convert the voltage to DC, charging the capacitor and lighting the light bulb. The capacitor smooths out the incoming voltage, so the multimeter can get a more stable reading of the voltage being produced. When we spin the Stepper Motor with the Power Drill, we should see it make some power. Even at the lower RPM’s we can expect from the wind turbine, this little NEMA 17 should produce a useful voltage. Getting the wind turbine to spin the stepper motor will require a bit of engineering. We’ll need to connect turbine to the motor without interfering with the fixed central support pipe. I settled on a somewhat rube-goldberg solution. A spinning rain hood/ internal gear that is spun by the turbine on a bearing ring of ½ inch delrin spheres. Inside the rain hood, a toothed internal gear meshies with a drive gear on pressed onto the stepper motor. As the turbine spins the rain hood, the gearing will spin the spin the stepper with about a 4:1 speed advantage. The delrin bearings keep everything spinning freely while keeping the teeth of the gears engaged with each other. There are spots in the ring to install the other two more stepper motors, which in theory would let us produce more voltage or current depending on how they are wired. For now, we’ll only install one stepper. Wow... 9 volts in a very light breeze. Now that is open circuit voltage, but it’s more than enough voltage to do something interesting with.